This video is best viewed in Chrome or Firefox. Play unlocks passion and potential. It's the foundation for building the best version of ourselves and our world. When we play, we live in the moment—conflicts are forgotten, joy blossoms and opens us to hope and inspiration. Unfortunately, in many communities, opportunities for play don’t exist, and in some, recess, art and music programs are being devalued. One World Play Project wants to change this and help make life full of play, hope and joy! Together, let’s champion play for everyone and give valuable play resources to those who need them most. We're partnering with Coaches Across Continents, Futbol por la Paz and Playworks to share play opportunities worldwide. 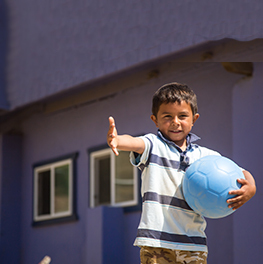 With every purchase you make, we'll donate a One World Futbol to one of these three amazing organizations. Through this campaign, we raised 327 One World Futbols.